We’d love your help. 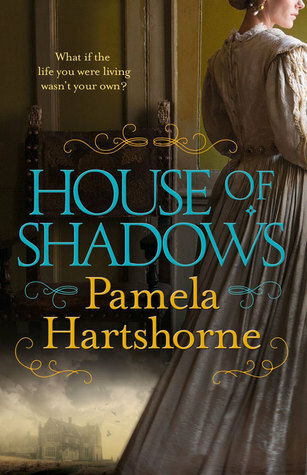 Let us know what’s wrong with this preview of House of Shadows by Pamela Hartshorne. To ask other readers questions about House of Shadows, please sign up. It is a haunting story shifting constantly and twistingly between two time lines, from a present-day reality to the alluring Tudor Era, but with only one place as its heart: Askerby Hall, the house of shadows. The central character, Kate Vavasour, wakes up from a coma in a hospital bed and the reader can follow her confused, uncertain steps back to life from right inside her mind, where she is convinced she is someone else, Isabel Vavasour, and where there is no sign of recognition of any of the It is a haunting story shifting constantly and twistingly between two time lines, from a present-day reality to the alluring Tudor Era, but with only one place as its heart: Askerby Hall, the house of shadows. The central character, Kate Vavasour, wakes up from a coma in a hospital bed and the reader can follow her confused, uncertain steps back to life from right inside her mind, where she is convinced she is someone else, Isabel Vavasour, and where there is no sign of recognition of any of the worried people surrounding her. She can vivdly remember Isabel’s life, her love for her handsome husband, Edmund, and the overwhelming tenderness she felt becoming the mother of their son, Kit. Kate realizes she is not Isabel, especially because that young woman lived under the reign of the other Queen Elizabeth, and perfectly knows that all she sees around her belongs to a totally different present. Still her mind goes on working very oddly and Isabel is a constant haunting presence. Kate find herself incapable of feeling anything for her own son, Felix, nor she recalls mourning her late husband, Michael. She has no memory of them, she has forgotten the feelings she felt for them and, definitely, she can’t explain why she climbed up Askerby tower, from which she fell down and only miraculously survived. I would give this 3.5stars if I could. The writing style was actually wonderful and the pacing was really nice. I found the protagonist in the current period interesting and enjoyable as well as the historical. My issues with the book were the sheer gullibleness of the main characters and how obvious the plot was, within minutes of meeting the character I knew who 'dunnit' which really ruined it for me. I also found the secondary characters beyond them too wooden to hold.my interest, they felt l I would give this 3.5stars if I could. The writing style was actually wonderful and the pacing was really nice. I found the protagonist in the current period interesting and enjoyable as well as the historical. My issues with the book were the sheer gullibleness of the main characters and how obvious the plot was, within minutes of meeting the character I knew who 'dunnit' which really ruined it for me. I also found the secondary characters beyond them too wooden to hold.my interest, they felt like thinning drawn tropes and which was sad. I also thought it was a shame there was less depth in the description and the historical characters scene and perhaps nit picking here are finding the rather anchronicistic personality of the historical female a little frustrating and tiresome. There must be ways to allow readers to relate to historical characters without making them all fit this mould of 'strong willed, independent, messy..
initially against marriage unless for love but who finds a great love despite not fitting the ideals of womanhood or wife's at the time. Despite work and everything else going on today, I read this book in one day. Such an atmospheric and enchanting novel. I did predict much of what happened (hence the 4 not 5 stars), but nevertheless this was a truly delightful, compelling read. I read this novel over the course of one day as I found I couldn't put it down. It's brilliant. Pamela is truely the queen of timeslip and I look forward to more from this fab author. A good read, I enjoyed it. Thanks Nadia! I absolutely adored Pamela Hartshorne's latest 'time slip' novel 'House of Shadows'. I enjoyed it so much that I began reading it last night and finished it first thing this morning - I really only put it down yesterday because I was so tired my eyes wouldn't stay open. Honestly, if I could have managed it I would have read through the night to finish this book. I like 'time slip' novels anyway- 'Mariana' by Susanna Kearsley is one of my favourite books, but there's just something about the way I absolutely adored Pamela Hartshorne's latest 'time slip' novel 'House of Shadows'. I enjoyed it so much that I began reading it last night and finished it first thing this morning - I really only put it down yesterday because I was so tired my eyes wouldn't stay open. Honestly, if I could have managed it I would have read through the night to finish this book. I like 'time slip' novels anyway- 'Mariana' by Susanna Kearsley is one of my favourite books, but there's just something about the way Pamela writes that for me makes her the best author of dual time stories out there. Her writing is extremely fluid and flowing - one minute you're in the present with the contemporary character, the next you have slipped into history to be with a character from hundreds of years ago without even fully realising it has happened. I think this subtle way of linking the time periods is a far more interesting, immersive way of telling both characters' stories than, say, the modern day protagonist fainting etc. everytime they're about to visit the past. Pamela Hartshorne's stories do all follow similar 'recipes' with recurring 'ingredients' such as: the city of York and the surrounding areas as the predominantly main setting, strong female characters as the main protagonists in both the modern day and 16th century storylines, the 16th century female meeting an unhappy end, modern day characters almost echoing the personalities/behaviours of 16th century counterparts... But this is honestly not a criticism! I've read all of Pamela's work and despite having these features in common, each story has also been very different. In actual fact it's these things that, everytime I finish one book, make me so excited to read the next! 'House of Shadows' was definitely a very spooky, haunting read - the way Hartshorne described Askerby Hall (where most of the story takes place) and some of the more sinister characters sent a chill down my spine! I think Hartshorne also does a tremendoes job of really bringing the Elizabethan period to life without ramming too much historical information down your throat. Kate Vavasour wakes in hospital after a devastating fall, she has no memory of what happened or, indeed,of who she is. People come to visit her in hospital and remind her that she is a young widow with a small son, but this means nothing to Kate, even her name feels wrong and as a tight band settles around her head, she begins to experience a life that has no reality in the here and now. Returning to Askerby Hall, a home she shares with her in-laws, Kate attempts to make sense of her surrounding Kate Vavasour wakes in hospital after a devastating fall, she has no memory of what happened or, indeed,of who she is. People come to visit her in hospital and remind her that she is a young widow with a small son, but this means nothing to Kate, even her name feels wrong and as a tight band settles around her head, she begins to experience a life that has no reality in the here and now. Returning to Askerby Hall, a home she shares with her in-laws, Kate attempts to make sense of her surroundings, but Kate's memories, which are frighteningly real, belong not to the present, but to Isabel Vavasour , some four hundred years earlier. House of Shadows is now the fourth book by this talented author that I have read, and as always, as soon as my eyes light on the first opening sentence, I know that she will not let me down. I'm guilty of reading her books far too quickly, telling myself at the start that I should take it slowly and savor each word, but of course I don't. I gallop through at speed and read until my eyes ache and I become immersed in a story that flits effortlessly between past and present, with neither timescale outshining the other and always with a real sense of purpose and readability. I am taken into a world that is believable, frighteningly realistic, and more than a little scary and even as Isabel and Kate's worlds start to collide, you can't help but want to believe that somehow it might work, that voices can speak to us across centuries, and that stories left untold will be finished, and that resolution for troubled souls can be achieved. Pamela Hartshorne has overwhelmingly cornered this niche in the dual time narrative genre. She is quite simply a master story teller, a weaver of words and her books are a joy to read. I can't wait to see what she comes up with next. Premise: When Kate Vavasour wakes up in the hospital, she can remember nothing about the family gathered around her bed, or of her life before the accident. The doctors diagnose post-traumatic amnesia, following a terrible fall from the roof of her home, Askerby Hall. The doctors say the memories should start returning. Which they do . . . but these memories are not her own. They belong to Isabel Vavasour, who lived and died at Askerby Hall over four hundred years earlier . . . Returning to her supposed home, Kate finds herself in a house full of shadows and suspicions. Unable to recognise her family, her friends or even her small son, she struggles to piece together her life. However, the memories of Isabel fight their way to the surface and demand to be known. Was Kate’s fall really an accident? Can she trust her own mind? Can she trust those around her? Kate as a character is fine. Not someone you instantly fall in love with but not someone too irritable either. I really liked Isabel as a character, fiery and insolent in a time period when woman were not allowed to be either. A few reviewers have commented on the fact the author does little in the way to disguise who the “bad guy” is (for want of a better term). I think this is a deliberate move by the author and don’t really think it detracts from the story. If anything, it gives Isabel a vulnerability in her otherwise strong-willed nature. If she didn’t have this, I think as a reader you would potentially find her too arrogant. What I am trying to get at is, in some ways, this story is predictable, but for me, that didn’t stop it being a really enjoyable story. The settings of this book are primarily around York/ remote villages of Yorkshire. The author really does a great job to capture the slower paced country lifestyle, the visitors to a grand country hall and weave cleverly into the storyline how formidable that home could be to someone not born into the family. I often think it’s useful to see an extract of a book to get an idea of the writing style. I think in historical fiction this is particularly helpful to get an understanding of the language tone the author has chosen to write in. I don’t recognize either of them. My eyes dart back to the nurse. I want to say, They’re not my family, but I can’t speak past the tube in my throat. House of Shadows is a story of possession, betrayal, discovery, love and redemption. It is a ghost story without ghosts - or at least not in the way you might expect. This is possession, but not in the Exorcist, spinning head and strange voices way. The supernatural element of this compelling tale is much more subtle than that. It is really the story of two women, separated by four centuries but united by their love and need to reconnect with their sons. Both women find themselves being manipulat House of Shadows is a story of possession, betrayal, discovery, love and redemption. It is a ghost story without ghosts - or at least not in the way you might expect. This is possession, but not in the Exorcist, spinning head and strange voices way. The supernatural element of this compelling tale is much more subtle than that. It is really the story of two women, separated by four centuries but united by their love and need to reconnect with their sons. Both women find themselves being manipulated by those they trust with dramatic and tragic results. When Kate Vavasour wakes in the hospital she remembers nothing of her life, her family or her friends. Everyone around her is a stranger. She doesn't even know why she is in the hospital and no one seems in a hurry to explain it to her. When her memories do begin to come back it is very quickly obvious that that can't be hers. In fact, they are the memories if Isabel Vavasour who had lived and died four hundred years before. Kate now has to not only reconnect with her own memories, rebuilding her relationships with those closest to her but also try to make some sense of her visions of Isabel's ultimately tragic life. As I said, this is not a ghost story as such Isabel's presence in Kate's life is a plea for help and as Kate begins to understand this, her fear is replaced by a dogged determination to find out all she can to answer Isabel's questions about her son. What she doesn't know is it was that very singlemindedness that landed her in hospital in the first place. House of Shadows is a tense and thrilling novel that kept me gripped right from the start. It was easy to piece together what was really going on with all the characters. At the heart of the book are two young mothers, both married into the Vavasour family, and both driven by a deep and enduring love for their husbands and sons. But ultimately, both are blinded by unquestioning loyalty to friends who have their own agendas. I really enjoy this kind of novel. I'm a fan of Kate Morton's work, and it reminded me of the obsessive way I feel that I need to finish. There is always a truth that needs to be known, and I end up desperate to find it. It's especially nice when the setting is an English manor home that's somewhat isolated, although making the protagonist, Kate, survive a fall off a tower and need a long recovery was actually a pretty effective way of isolating the action. Well, that and her amnesia. A protagon I really enjoy this kind of novel. I'm a fan of Kate Morton's work, and it reminded me of the obsessive way I feel that I need to finish. There is always a truth that needs to be known, and I end up desperate to find it. It's especially nice when the setting is an English manor home that's somewhat isolated, although making the protagonist, Kate, survive a fall off a tower and need a long recovery was actually a pretty effective way of isolating the action. Well, that and her amnesia. A protagonist with amnesia is always going to seem isolated because everyone else around her remembers what she's like except her. Even better is that we have a family obsessed with preserving the home as it was in their accepted history, down to letting in visitors to take tours. There's mysterious bones discovered, the ghost story of a servant girl who committed suicide by jumping off the same tower from which Kate also falls and sustains her injuries and some memories Kate regains that aren't hers. A very good story but I cottoned on fairly early what was happening. It builds slowly so stick with it. If you don't like time slip stories this one isn't for you. Kate has an accident and loses her memory. However, she has other 'memories' as Isabel but how can these be memories when Isabel lived 400 years earlier? When she goes home her son, Felix, refuses to acknowledge her as his mum. The dog, Pippin, who was devoted to her prior to the accident, does not accept her and growls or snaps when A very good story but I cottoned on fairly early what was happening. It builds slowly so stick with it. All'inizio mi ha commosso e coinvolto molto: Kate si sveglia in ospedale e non ricorda nulla, non riconosce nessuno. E' un inizio drammatico, e prometteva bene. Mi sono piaciute molto di più le parti ambientate nel passato, quelle di Isabel e del marito. Sono ben studiate, la trama è interessante e accattivante, bella l'ambientazione, che poi è la stessa casa dove adesso abita Kate. Peccato che verso pagina 80 si capisca benissimo chi sia il responsabile della sorte di Isabel e dell'incidente di All'inizio mi ha commosso e coinvolto molto: Kate si sveglia in ospedale e non ricorda nulla, non riconosce nessuno. E' un inizio drammatico, e prometteva bene. Mi sono piaciute molto di più le parti ambientate nel passato, quelle di Isabel e del marito. Sono ben studiate, la trama è interessante e accattivante, bella l'ambientazione, che poi è la stessa casa dove adesso abita Kate. Peccato che verso pagina 80 si capisca benissimo chi sia il responsabile della sorte di Isabel e dell'incidente di Kate, e tutto il resto del libro l'abbia passato frustrata perchè nessuna delle due protagoniste lo capiva, e agiva anzi con un'ingenuità ai limiti del ridicolo. Come storia non è forse originalissima e poteva sicuramente essere fatta meglio, comunque sono riuscita a leggerlo senza abbandonarlo, nonostante le 400 pagine che si potevano benissimo ridurre. The story winds its way between these two stories - complicated by the modern woman's traumatic memory loss. It meanders through the two stories until it reaches the rather obvious ending - no surprises there! Tak tohle bylo trochu zklamání. Autorka má rozhodně skvělý vypravěčský styl, ale námět byl příliš průhledný, takže žádné překvapení, ani dychtivé pátrání se nekonalo. Hada, kterého si Kate/Isabel hřály na prsou, odhalí bystřejší čtenář velmi rychle. Taky se mi to trochu vleklo, Kate mi přišla málo "akční" ve svém pátrání, zvlášť když měla všechny zdroje po ruce, a hlavně docela brzy pochopila, co se jí to děje. Isabel byla hrozně naivní, až to podle mě hraničilo s hloupostí. Time slip novels are a guilty pleasure, much like my enjoyment of gothic mystery romances. This one was fast paced and mysterious... and I enjoyed it even though I figured out the central "who done it" in the first chapter or so (although the whys were a little harder to decipher). Perhaps not as good as Susanna Kearsley or Barbara Erskine, but still a fun read. A solid 3 1/2 stars from me. This one is almost a new genre for me: it is a different subject matter to what I am usually drawn to, so I came in not knowing what to expect. I found myself quite engrossed by the end: I couldn't help but feel the gripping eerieness of the setting and found it quite hard to put down. Great story that had so many facets to it. Love story, ghost story, mystery - all rolled into one amazing story. Sad that it ended. I wanted it to go on and on. What a brilliant story. Just could not put it down. Similar themes I know to Tines Echo of experiencing a past life and resolving a characters issues from the past but different enough to be wholly engaging. It was an interesting read but at the same time frustrating, because it was pretty obvious from the beginning what had happened in both storylines, but the main character seemed oblivious to it somehow. House of Shadows was written quite well and is usually the kind of book I flip over, but despite the writing I couldn't get into it the way I wanted to. After a haphazard early career spent working and travelling around the world, I started writing romance in order to fund a PhD in Medieval Studies. Naturally, that didn't turn out to be quite the easy option I thought it would be, but I did in the end complete a thesis on the street and the perception of public space in later medieval and early modern York in 2004. My research formed the basis of After a haphazard early career spent working and travelling around the world, I started writing romance in order to fund a PhD in Medieval Studies. Naturally, that didn't turn out to be quite the easy option I thought it would be, but I did in the end complete a thesis on the street and the perception of public space in later medieval and early modern York in 2004. My research formed the basis of TIME'S ECHO, and many of the individuals I encountered in the records of Elizabethan York appear in the novel. I still live in York and continue to write romances as Jessica Hart in tandem with time slip novels for Pan Macmillan - and yes I *do* often get confused by my split identities!